Bruins don Winter Classic threads The Boston Bruins are certainly getting their money's worth from those Winter Classic jerseys. Fans at this afternoon's matinee against the Vancouver Canucks were treated to the gold jersey for the third time since the New Year's Day game at Fenway Park. More game photos. This is the most we've seen a team wear the special jersey in the same season as their Winter Classic appearance. However, it has become common to see some teams appropriate the sweater as an alternate uniform the following season. 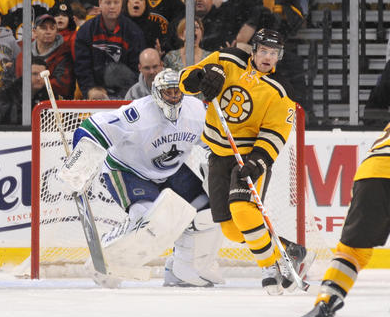 The Bs blew a 2-0 first period lead, losing to the Canucks in a shootout today. The Bruins are now 0-2 in the yellow unis since winning the Winter Classic on Marco Sturm's overtime goal.